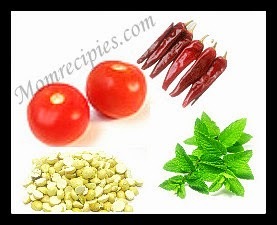 Tomato Mint Chutney is a simple and delicious Chutney.It goes well with Dosas and Idlis. Due to its tangy and minty taste children likes to have this. Heat oil in a pan add the urad dal and red chillies and saute for few seconds until golden brown. Then add the onions and garlic and when they turn golden brown (about 4-5 mins), add chopped tomatoes. Stir well and cook for another 5-6 mins until the tomatoes turn soft. Then add the chopped mint leaves and cook for 2-3 mins until the leaves wilt and soften. Then, add the roasted gram dal and salt. Mix well to combine all the ingredients together and remove from fire. Cool and grind adding the tamarind and little water. In the same pan, add few more drops of oil and saute the mustard seeds when mustard seeds pop then add hing and turn off the flame. Add the grounded chutney to this tempering and mix well. A delicious, simple chutney that's bursting with mint flavor is now ready !!! Serve with Rice, Dosas, Idlis and Rotis. For a variation in flavor, replace mint with coriander leaves . Adjust the amount of red chillies or green chillies as per your taste.